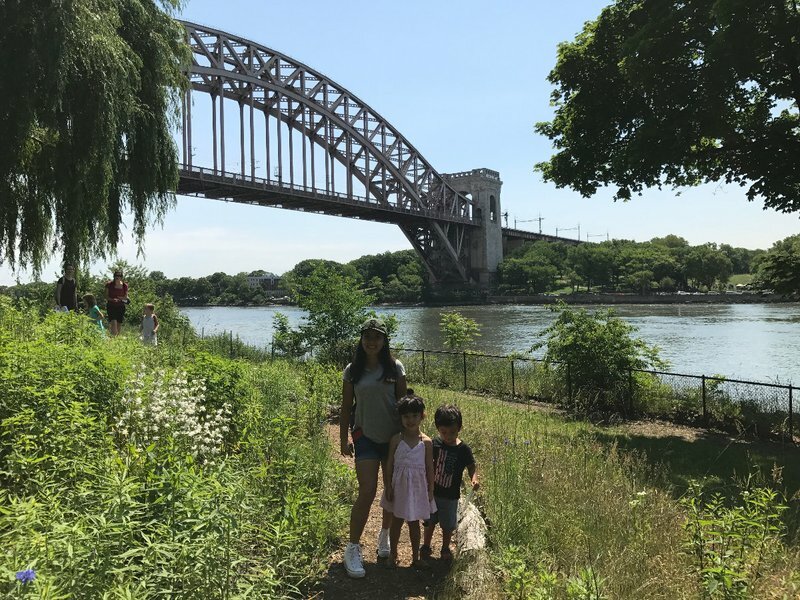 Queens may have been the focus of this stay in New York City, but that didn't mean we were going to leave without visiting Manhattan. I've been to most of the major cities in the world, but I've never encountered anything like the collection of unique neighborhoods jostling against each other in downtown Manhattan. For lovers of cosmopolitan culture it has to be one of the most interesting areas in the world to walk around in. The only place I can think of that comes close is central London. 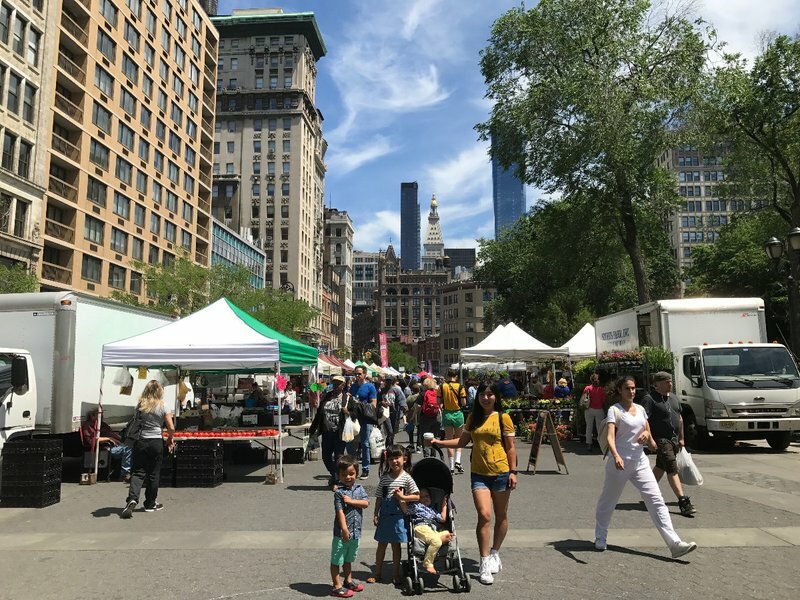 We kicked off our morning at the Union Square Greenmarket, the largest and most well-known farmer's market in the city. 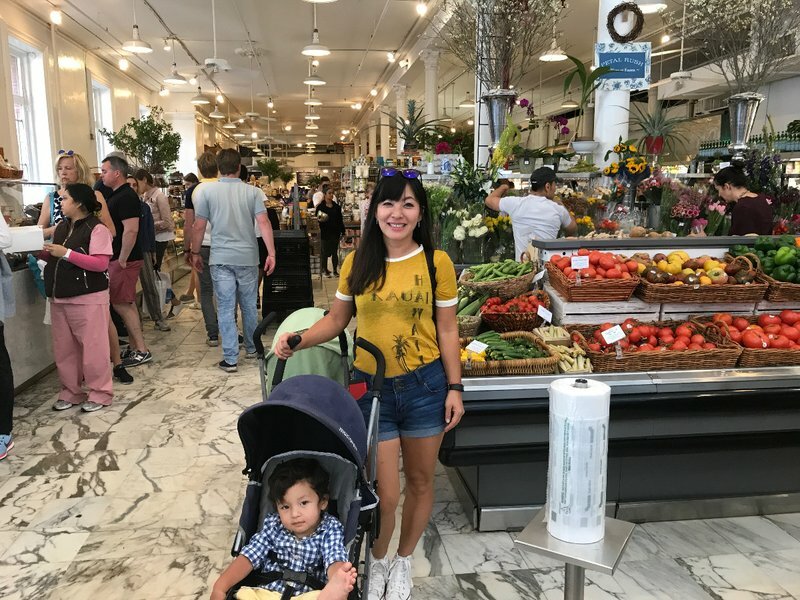 The setting surrounded by New York skyscrapers is incongruous, but New Yorkers are very discriminating when it comes to their food. The stalls were laden with the highest quality produce and there were countless options for artisanal meats and baked goods. 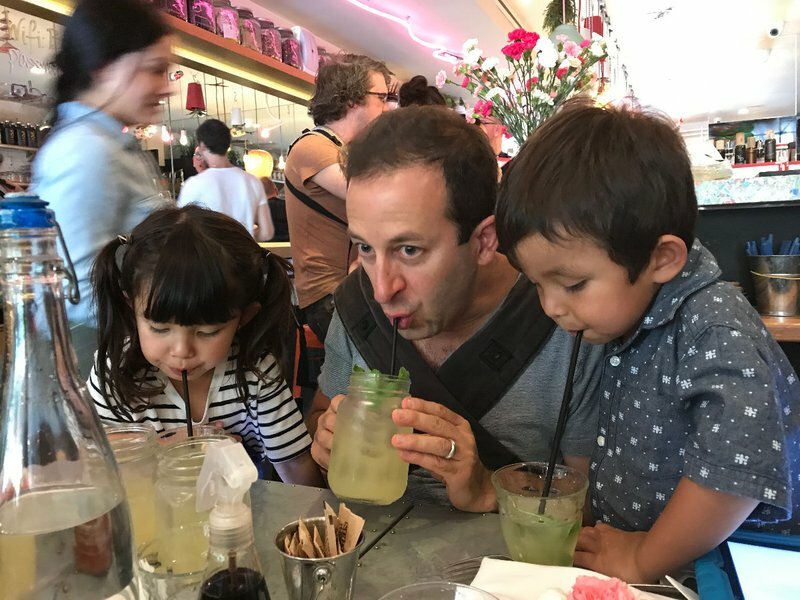 After a light lunch with fresh-squeezed lemonade, we drove down to my favorite downtown neighborhood, Soho. There we discovered that street parking is currently non-existent, and were forced to pay extortionate rates at a lot. I think I paid forty-five dollars for three hours, and that was advertised as a deal. We found our way to Dean and Deluca, a gourmet food store I've been going to since I was kid growing up in Brooklyn. 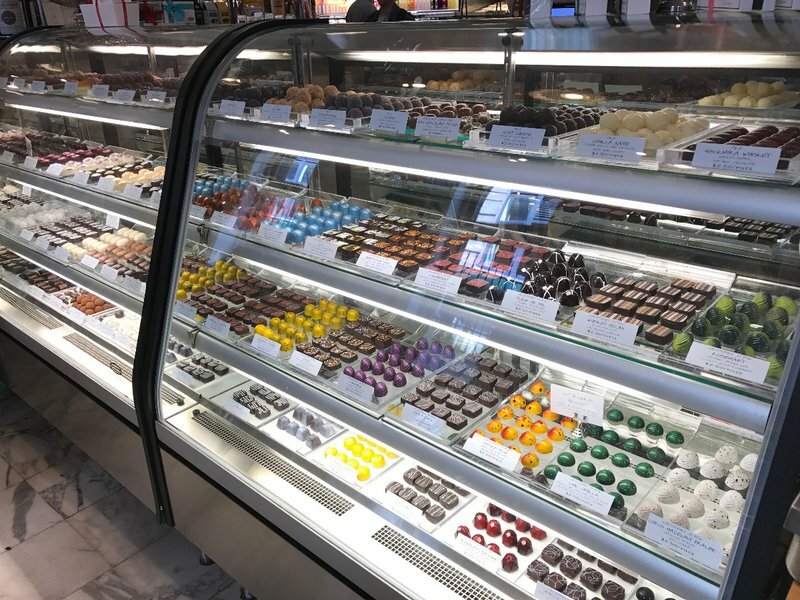 The store has gotten more and more crowded over the years, but it still has the best selection of hard-to-find delicacies that I've ever seen. 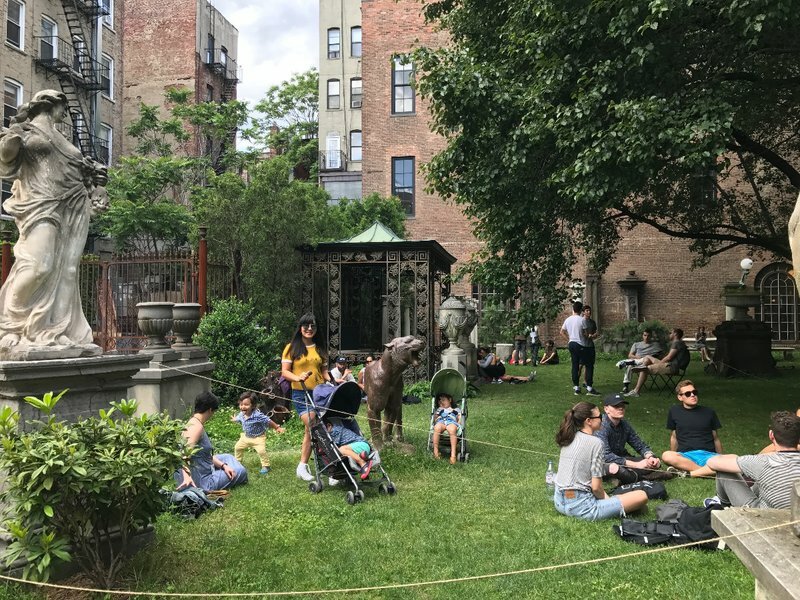 We walked around the neighborhood and enjoyed the unique Soho atmosphere, and eventually ended up in a beautiful park tucked away amidst the brick apartment buildings. 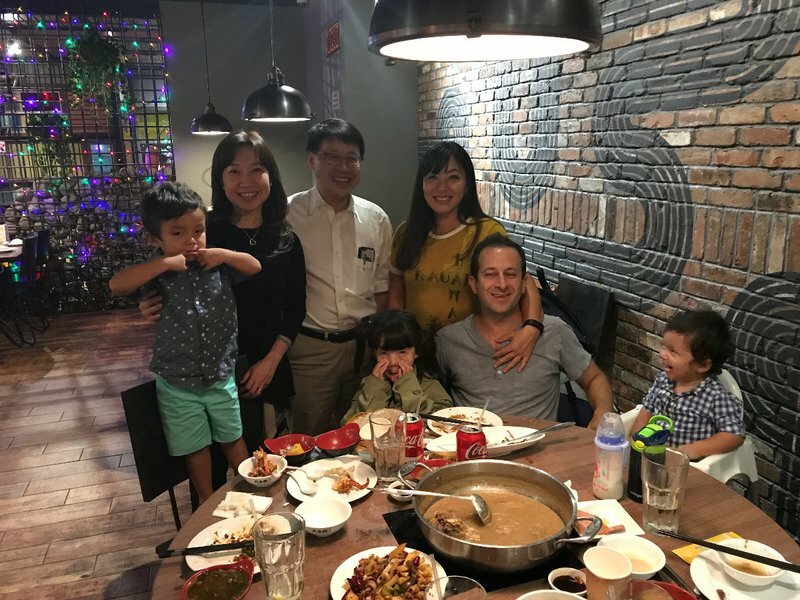 We drove back to Queens and visited a few more ethnic food stores on the way back to Flushing, where we met my college roommate George and his wife for a hot pot dinner. Then we all went back to the Chinese supermarket at New World Mall for another shopping trip before calling it a night. I had a lot of special events planned for Saturday. One of the huge advantages of living in a metropolitan area with more than ten million people is that there's never any shortage of activities. The only problem I had when looking at the list was choosing which ones would be the most fun. 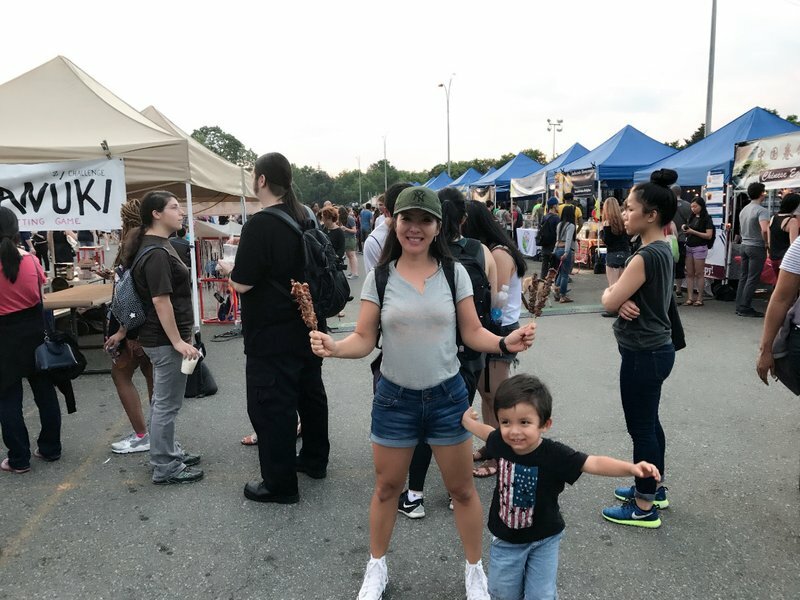 Eventually we settled on a scavenger hunt, a barbecue festival, a Brooklyn neighborhood party, and a Queens night market. In twelve years in Miami I've never been able to line up a day like that. 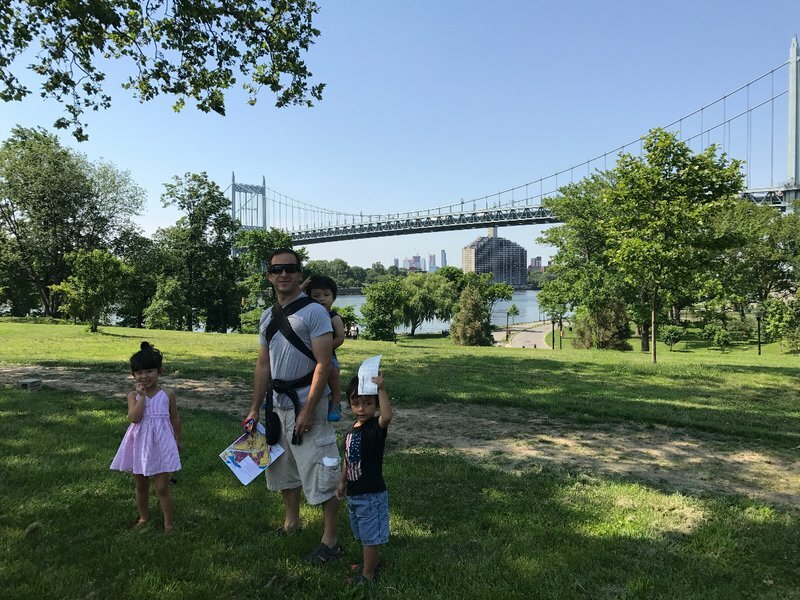 Our first stop was the Randall's Island Treasure Hunt, which turned out to be more of an orienteering activity without any actual treasure at the end. Nevertheless, the older kids had a great time perusing the map and scampering around the southern part of the island hunting for the next control point. 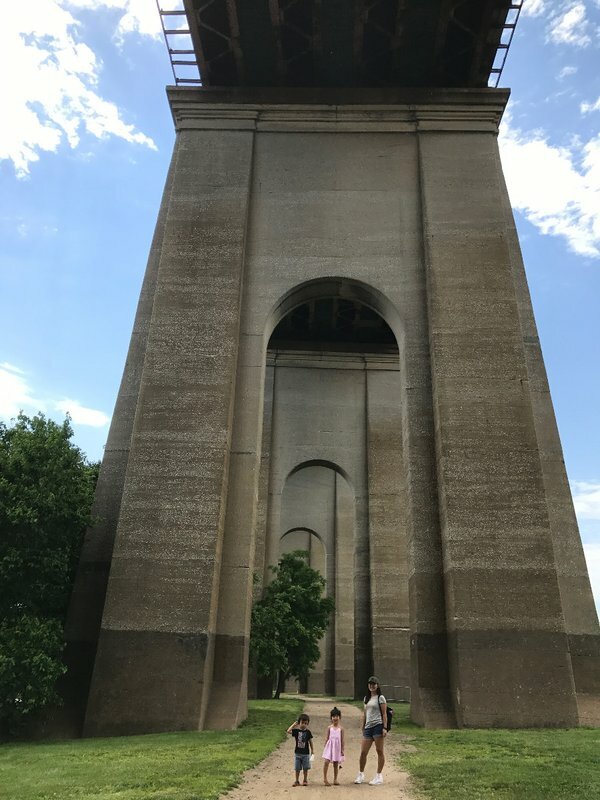 One particularly beautiful spot on Randall's Island is beneath the Robert F. Kennedy Bridge to Queens. 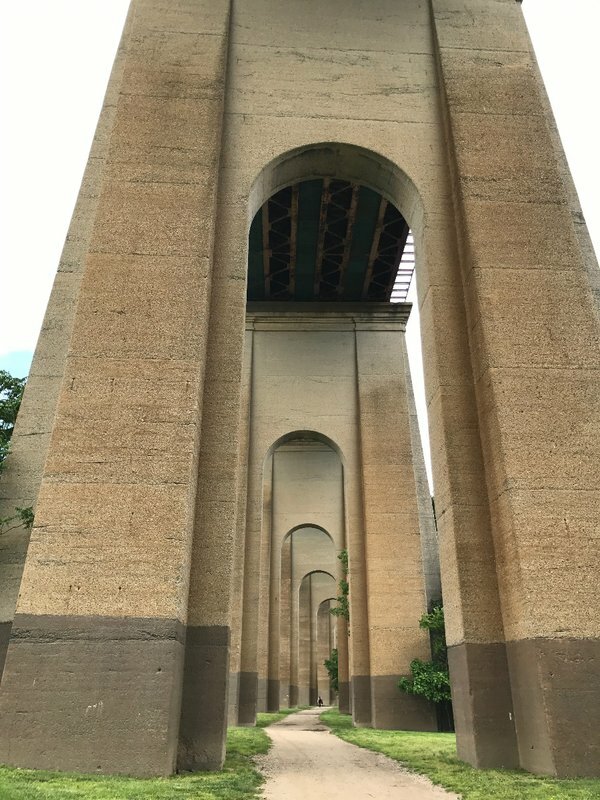 The arched concrete piers that support the section of the bridge that traverses the island look like the entrance to a palace created by a lost civilization of giants. 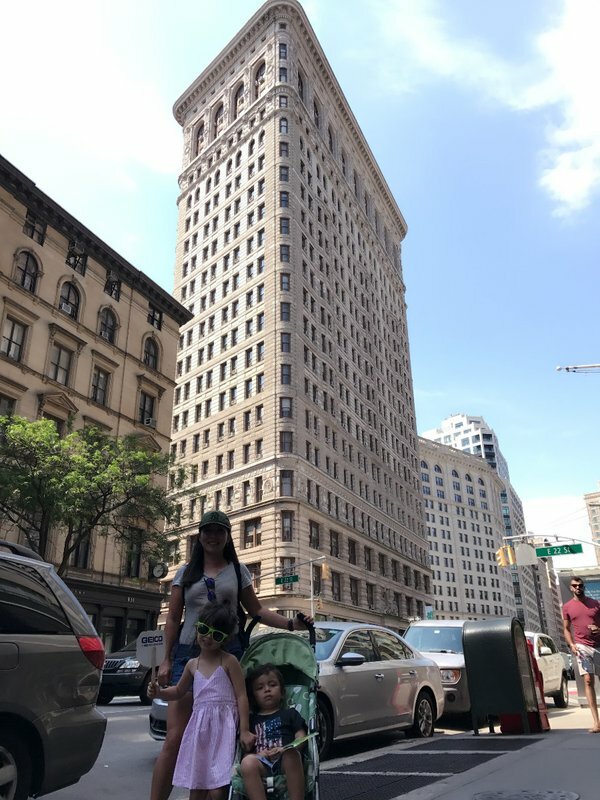 We drove to downtown Manhattan where I was prepared for the parking situation with a new weapon, the SpotHero app. This app allows you to shop for parking garages online and purchase a space in advance for much less than you would pay just driving in. It makes a huge difference when parking downtown can cost forty dollars or more for a couple of hours. 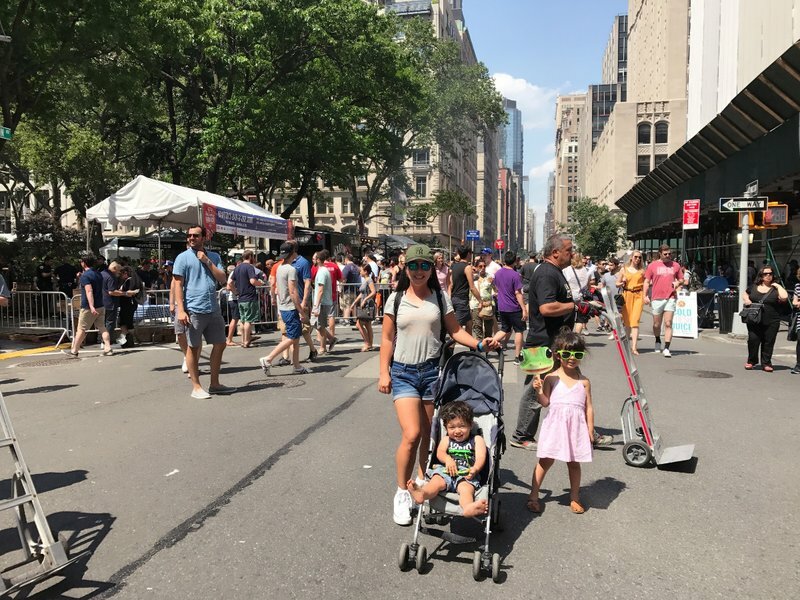 My fifteen dollar reservation worked like a charm and we took a short walk to Madison Square Park and the Big Apple Barbecue Block Party. This annual festival attracts barbecue specialists from around the country who set up trucks around the perimeter of the park. The park was crowded but we were able to find enough grass to put down our mat and I left Mei Ling to guard the kids while I foraged for barbecue. There was no shortage of things to see in the busy area around Madison Square Park. 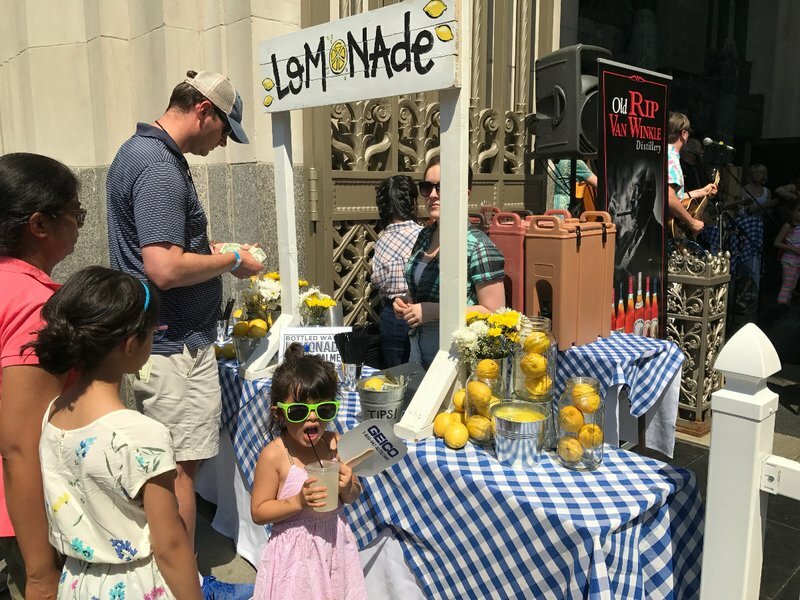 Just outside of the park we found a fresh-squeezed lemonade stand, the famous Flatiron Building, and a Hare Krishna parade. 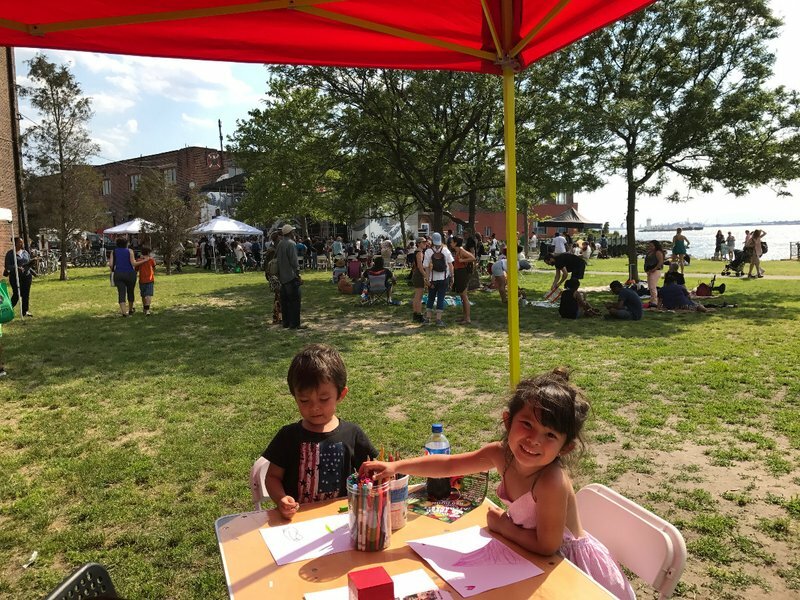 Thanks to the barbecue lunch was taken care of so we went back across the East River for Red Hook Fest, a community arts festival in Brooklyn. 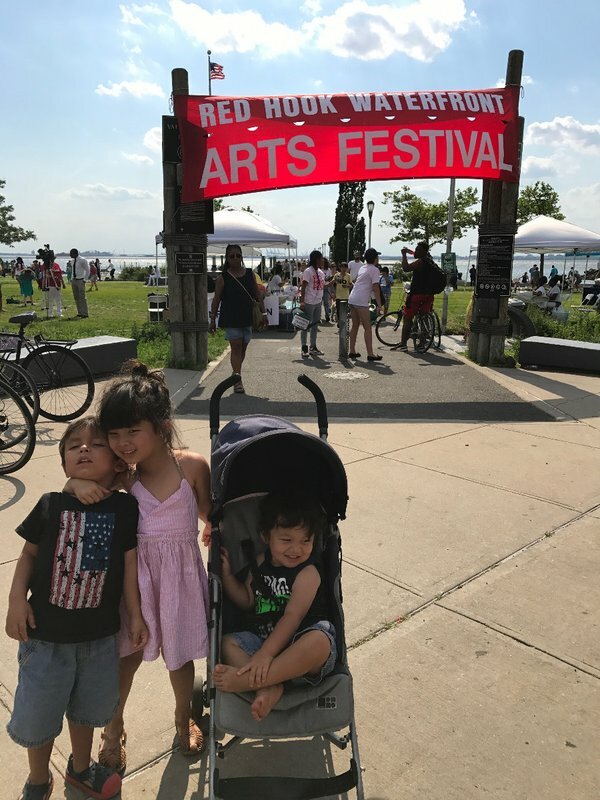 Red Hook was another area that used to be a "no-go" neighborhood when I was growing up in Brooklyn in the 70's and 80's. 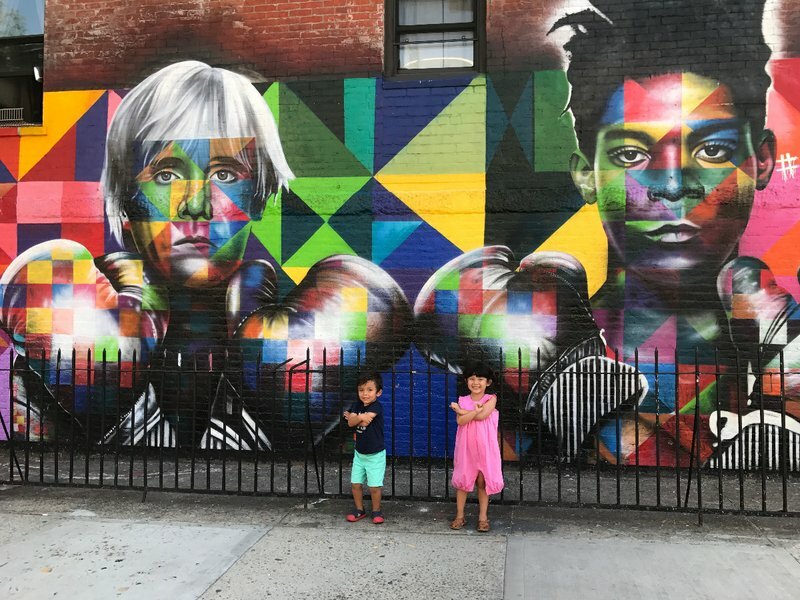 However, like Bushwick and Bedford-Stuyvesant, the area has experienced a renaissance in recent years which has been spurred forward by the rebuilding effort after Hurricane Sandy. However, the lack of proximity to the subway seems to have prevented the same kind of hipster explosion that has transformed Williamsburg and LIC. The festival was pleasant if somewhat low-key. 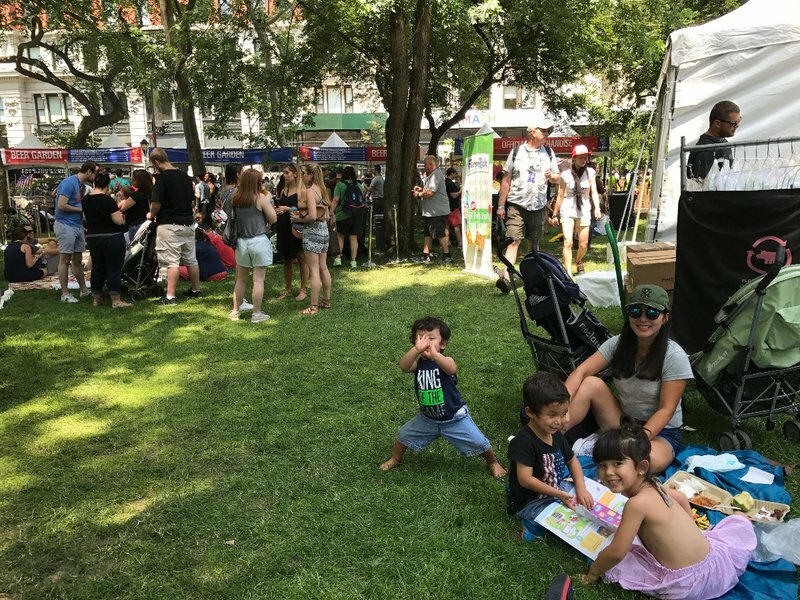 The kids spent the time at an art tent and playing with paper planes while Mei Ling and I watched some activist-minded spoken word performances. Relaxing in the waterfront neighborhood park was a great way to spend the afternoon. 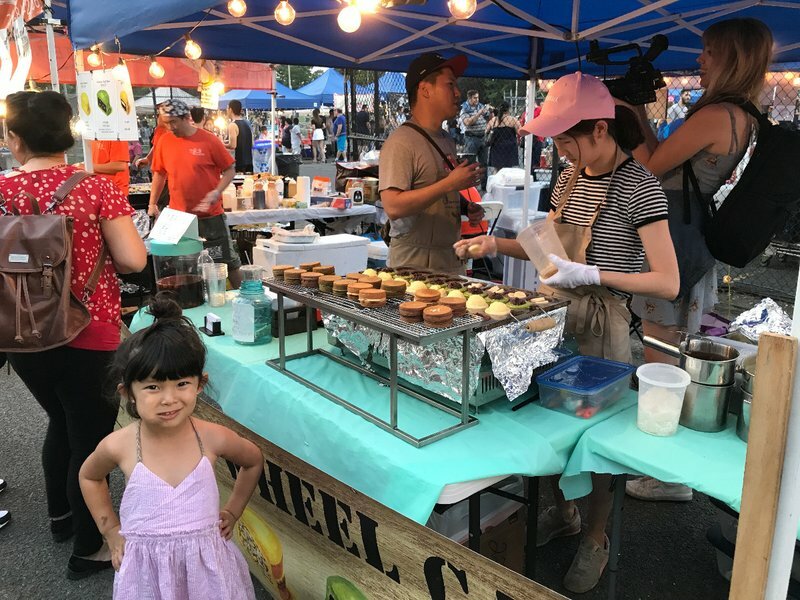 The highlight of the day came at the end with a trip to the Queens International Night Market, a huge convocation of ethnic food stalls held every Saturday night in the summer in Flushing Meadows. 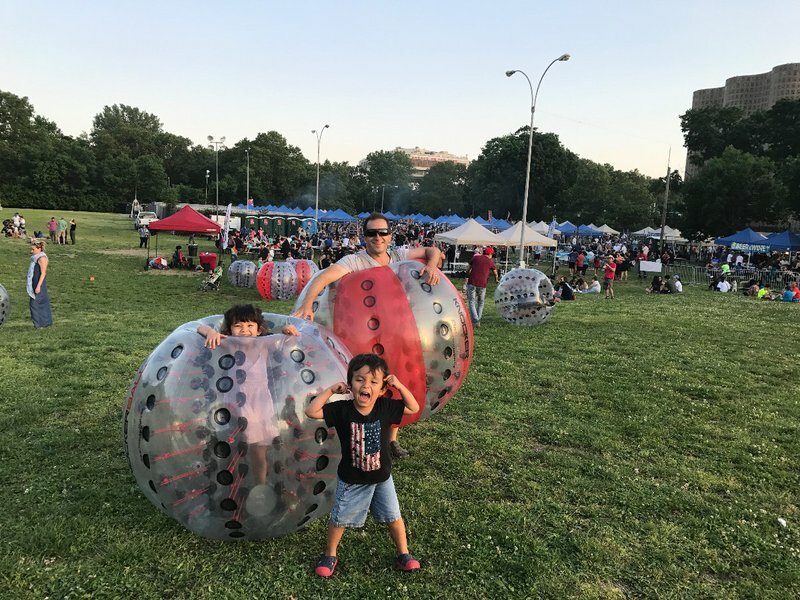 Before gorging ourselves we treated the kids to a game of knockerball, where we rolled them around in enormous inflated balls on a grassy hillside. Fortunately, despite my trepidation, no one suffocated or threw up. The market stalls mostly featured cuisine from Latin America and East Asia. 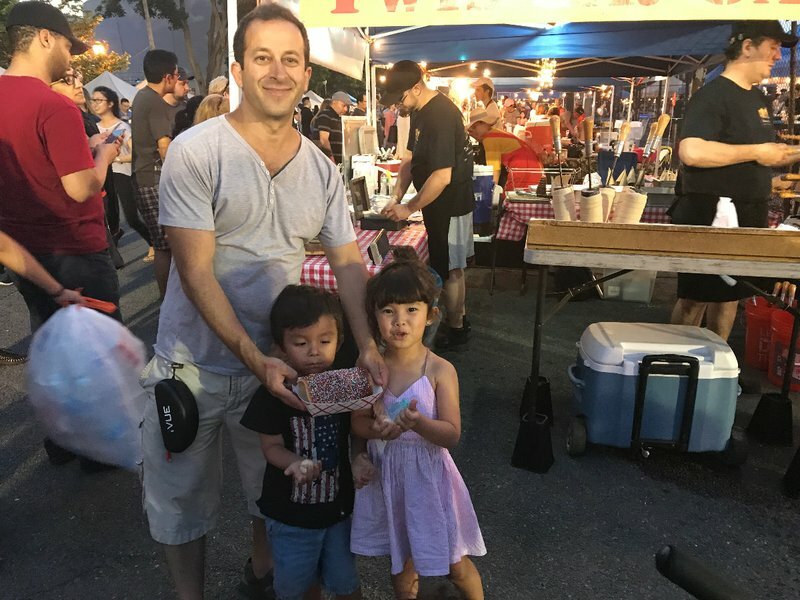 The selection was broad and the atmosphere was energetic, with both vendors and patrons reflecting New York's amazing cultural diversity that is unequaled anywhere in the world. After we'd filled up on meat skewers and ceviche, we hung out outside the market where they had a succession of DJ's and performers at an outdoor stage. The highlight was a crew of talented Asian breakdancers. 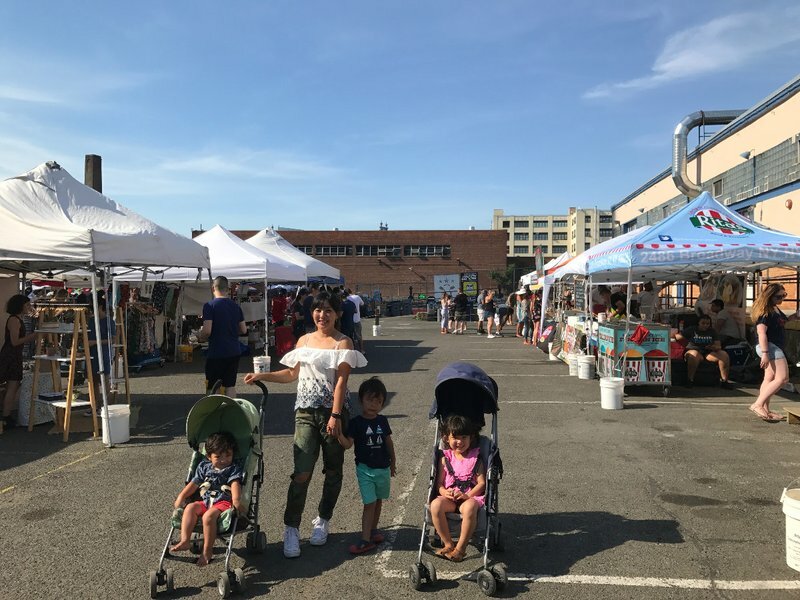 We started our last full day in New York at the Jackson Heights Greenmarket, a year-round Sunday farmers market in Queens. 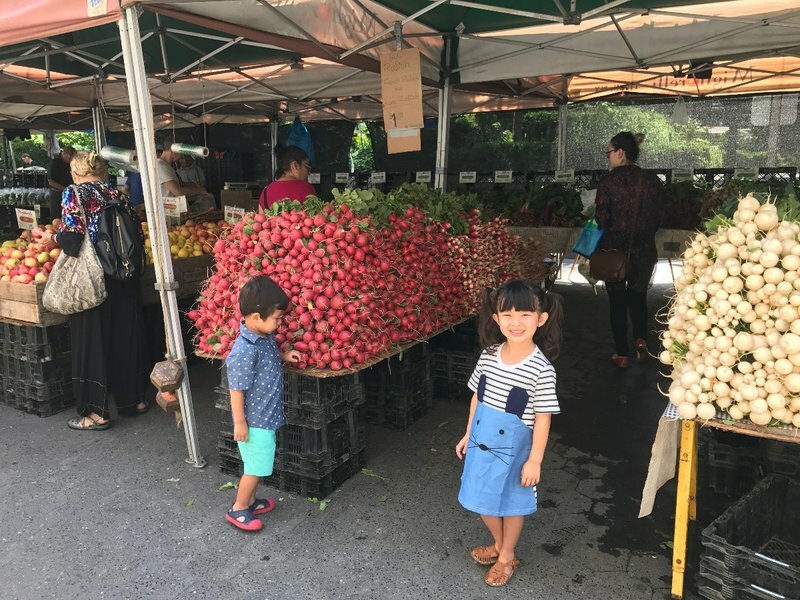 It was a pleasant, medium-sized produce market in a very diverse residential neighborhood. 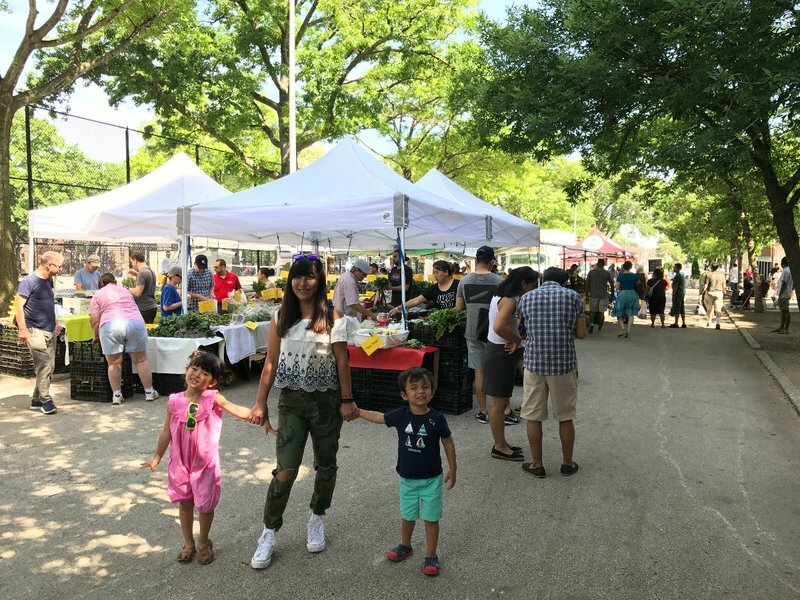 The market was adjacent to a community park with a huge jungle gym that made the kids' morning. 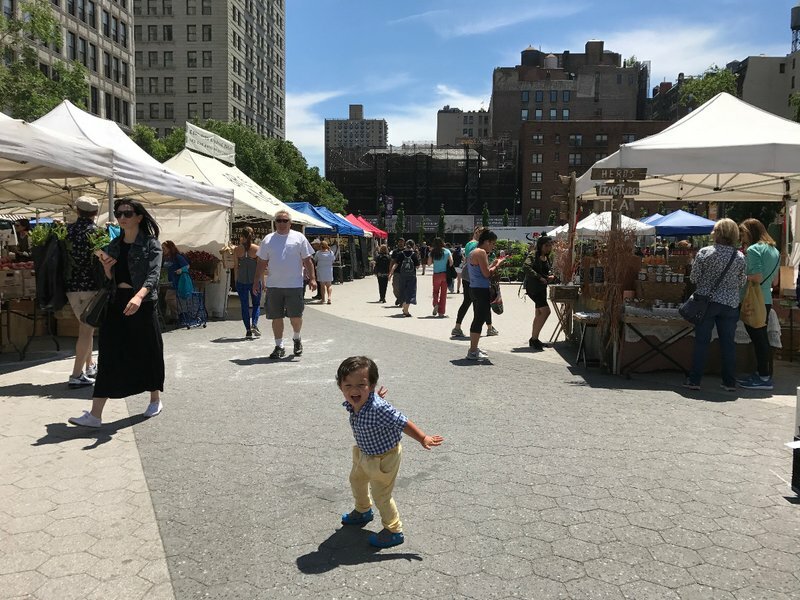 We headed back close to our home base for LIC Flea and Food, a weekend craft and food market on the bank of the East River. 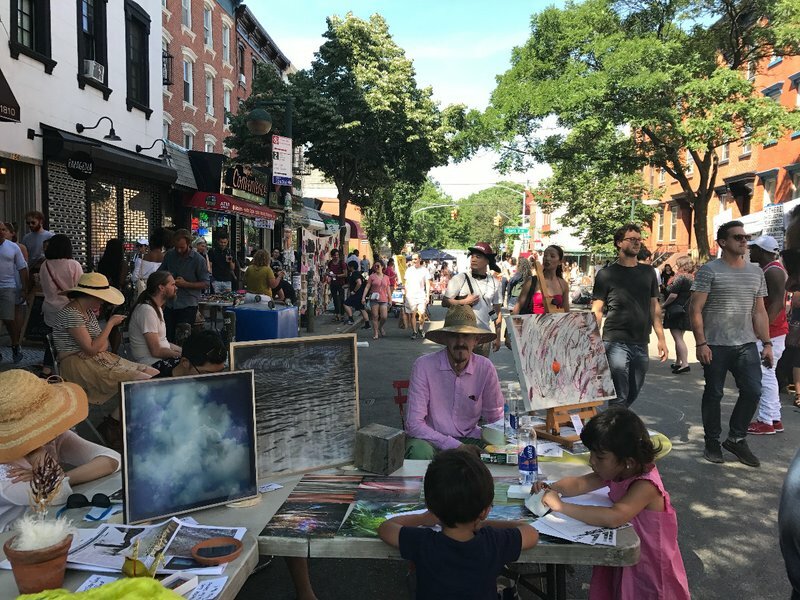 We couldn't putter around the flea market for long, because we had to met old friends at the Bedford Avenue block party in Williamsburg. 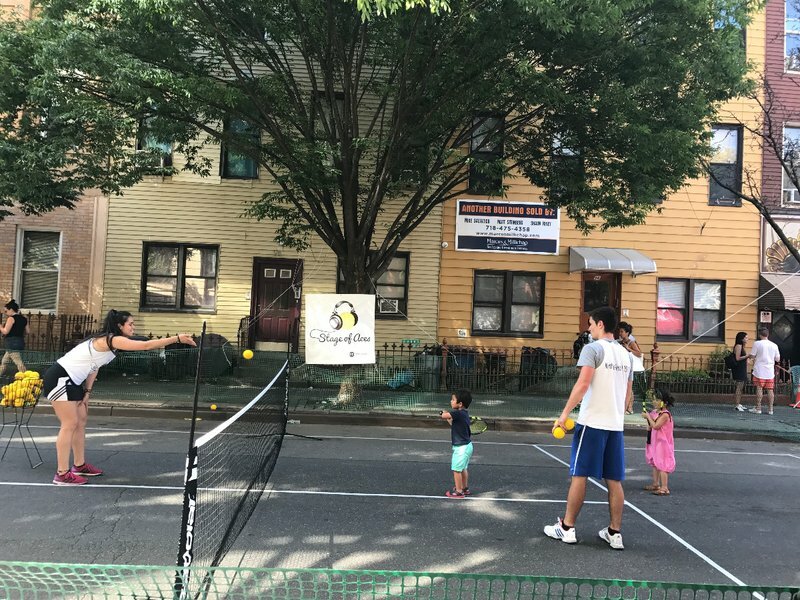 Naturally the kids found the art station right away, and got their first taste of tennis at an impromptu court laid down in the middle of the street. 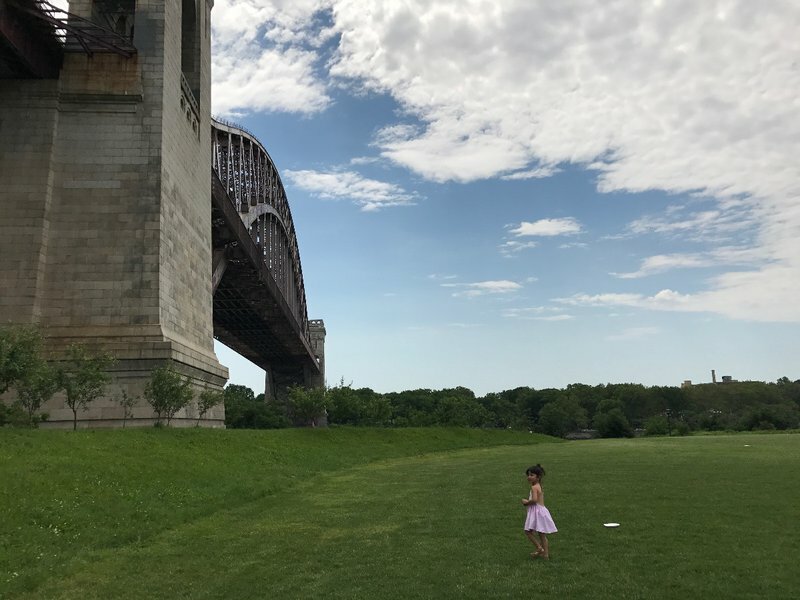 New York City is definitely a great place to be a kid in the summer. We spent the evening bouncing around ethnic food stores in Queens and then headed back to Flushing for more Asian food. 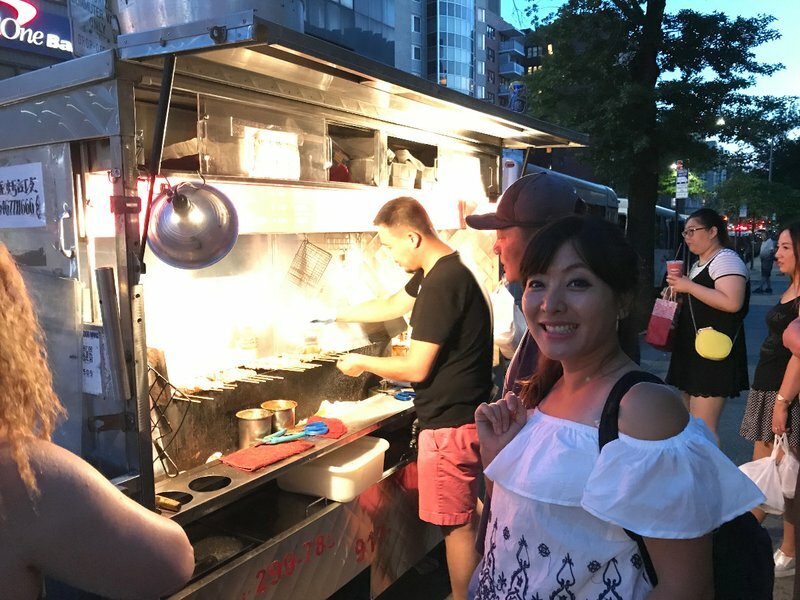 After some hunting around, we found one of the legendary Xinjiang barbecue trucks for our final New York City meal. Our flight to Taipei the next day would be leaving before lunch time.